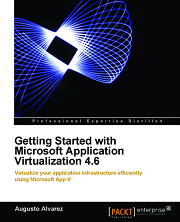 The release of my new book is just around the corner, “Microsoft Application Virtualization Advanced Guide”. 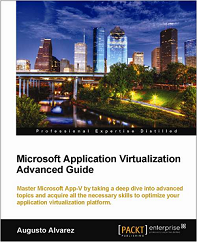 In this book we’ll take a closer look to several advanced topics in App-V, including some new ones like Server App-V, which is included in System Center Virtual Machine Manager 2012 (platform still in Release Candidate stage). 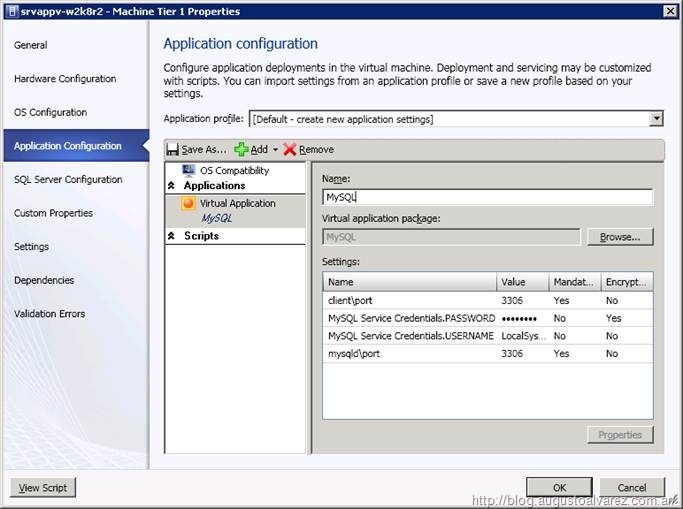 In this current version, with System Center Virtual Machine Manager 2012 in Release Candidate, Server App-V is oriented to business applications (Dynamics and Web Apps mainly) but it is possible to include others. COM/DCOM/COM+ objects: These components are registered in the deployment process, this way other applications in the server can access them. We cannot capture Windows Server Roles. Deploying these kinds of roles is a task performed by SCVMM 2012. We can virtualize Web Apps but we cannot virtualize IIS. In IIS, it is supported to virtualize Web Apps and virtual directories. “Web Deploy” tool is used in this process of deploying Web Apps. For more information about Web Deploy take a look to the following link: “Web Deploy 2.0” http://www.iis.net/download/webdeploy. SQL Server is not supported in this version. SQL Server Express is, but there’s no official guideline on how to capture it by Microsoft. 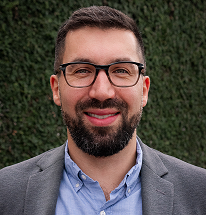 Device drivers are still not supported in Server App-V.
Not supported in this release but are priorities for next version: SharePoint and Exchange Server roles. An important part of understanding Server App-V is to differentiate it from Desktop App-V; in the following section we will review the basics difference between these two platforms. 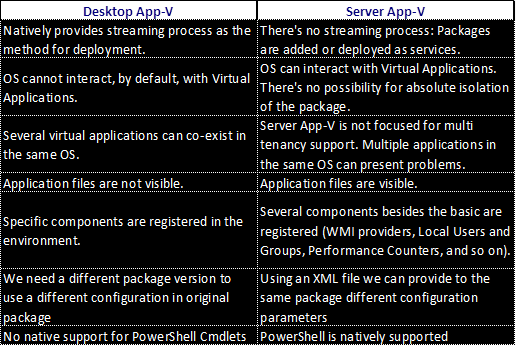 Server App-V and Desktop App-V work similarly, but there are some important differences between the two and we must understand them in order to analyze if Server App-V fits in our environment. The sequencing process in Server App-V is quite similar to the process we already know in Desktop App-V. Prior to working with the Server App-V Sequencer, we must remember the basic differences we’ve talked about in the Desktop App-V experience: Isolation, Server App-V packages are not meant to co-exist in the same OS. Use the same base OS in the Server App-V Sequencer and client machines. This particular “best practice” appears as a default requirement in Server App-V. 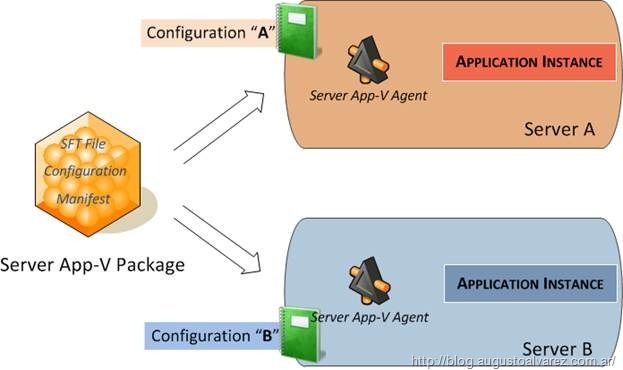 When a Server App-V application is sequenced, includes by default the roles and features enabled in the sequencer and set those as requirements for the Server App-V Clients. If we think about it, makes sense, since we are using server applications which interact with several OS components. Any OS inconsistency should lead us in Server App-V applications malfunctions. If possible, sequence your application to a Q:\ drive. Use Virtual Machines and snapshot capabilities with the Server App-V Sequencer. And, of course, always sequence a new application with a clean OS image. Enhanced details of supported applications in Server App-V.
Understanding SCVMM concepts like Service Templates and Private Clouds. Reviewing Server App-V and SCVMM 2012 integration. Sequencing Server App-V applications, taking MySQL as an example. Deploying Server App-V applications, using SCVMM and PowerShell deployment. The book is available for pre-order in Pack Publishing website.